Bracket clocks are not only beautiful to look at but they also have the added bonus of beautifully engraved script on the back of the movement. Antique Bracket clocks are spring-driven pendulum clocks, most often housed in a rectangular case with a carrying handle on top. Although the earliest clocks were made in Holland, they reached the peak of their development in England. But they were also placed on a table or sideboard as they would be today. The English bracket clock first appeared in the early 1600s and continued to be made into the 20th century. However, production declined from the mid-19th century and ceased due to disruption caused by the First World War. The classic period for bracket clocks is 1660-1720, when they were made with a square or rectangular dial. Thereafter the dial was usually arched at the top, except for some Regency dials which were round. Examples from the 17th and 18th centuries have a verge escapement 19th-century clocks have an anchor escapement. However, many verge escapement clocks were converted to anchor escapement in the 19th century. Later re-conversion restores only about half the value but an original verge escapement bracket clock is much more desirable. The price range and quality of antique bracket clocks is huge. 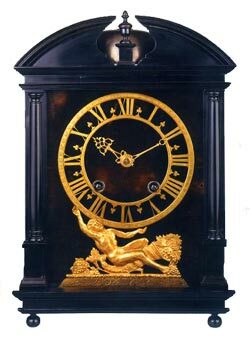 You could pay around £1000 for a typical ebonised Victorian example or as much as £50,000 for a late 17th or early 18th-cenrury clock by a top London maker such as Thomas Tompion. 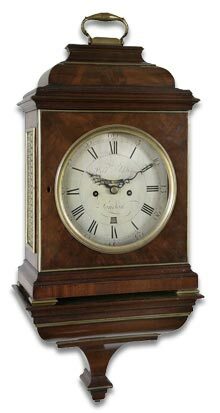 Regency and Victorian bracket clocks have also become quite collectable due to the quality of the movements. 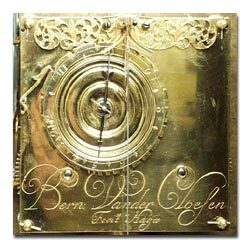 The first Dutch pendulum clocks were the forerunners of English bracket clocks and the earliest Dutch bracket clocks (circa 1658-70) are known as Haagse clocks. They have a velvet-covered rectangular dial with a brass chapter ring and spandrels. They were usually hung on the wall by two iron loops attached to the back board. 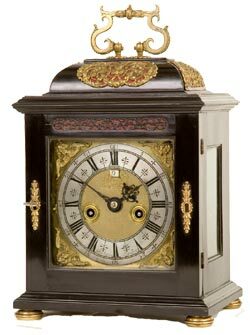 From the early 18th century most bracket clocks sold in Holland had a London movement with a Dutch-made case. These clocks have a chapter ring with the minutes marked on lobes between the hour numerals. Some larger clocks have painted dials with windmills or musicians playing in time to the music. Eighteenth century Dutch bracket clocks can sell for two to three thousand pounds, but Haagse clocks can sell for tens of thousands. Clocks featuring music and automatons can be over £10,000. The earliest French bracket clocks, called pendules rellgieuses, date from the mid-1660s and are close copies of the Dutch clocks, with a velvet, hinged dial. French clock movements were normally put in the case from the front, the opposite of English clocks and French dial doors or bezels were hinged on the left. English clock doors were normally hung on the right. By the early 18th century, the front mounting plate was no bigger than the chapter ring and the front door closely framed the dial. At the same time, the sides of the case began to be waisted below the dial, heralding the sinuous shape of most French Regency and Louis XV bracket clocks. During the 18th century, French bracket clocks had the winding holes positioned asymmetrically, unlike those of the 19th century. Prices vary considerably, but standard French bracket clocks can sell for one to two thousand pounds. 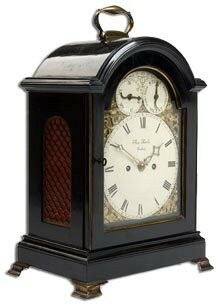 Check the latest selling prices in our antique bracket clock sales section. From about 1660-1673, the architectural period, the earliest bracket clocks are quite large about 16-20 in (40-50 cm) tall and have a pediment top. By 1675, the characteristic case style was established and a rectangular box with projecting mouldings top and bottom, a handle on top, glazed doors front and hack, and rectangular panels, either glazed or with pierced frets to the sides. Within this basic format variations in the materials of the case and the shape of the top indicate the date. Case materials follow the same date lines through oak, walnut, mahogany and so on. A few incorporate marquetry, but ebony and later ebonising remained popular for as long as bracket clocks were made, roughly one out of every two bracket clocks is black. The antique bracket clock top from 1675 to 1720 was in the basket or caddy shape. This is cushion moulded in wood or repousse gilt brass. Some clocks have a double repousse basket top, with a secondary cushion or bulbous moulded section above rhe first. The inverted bell top with two contrasting curves, the lower convex, the upper concave dates from 1720 to 1770. This style overlapped with the bell top from 1760 to 1810 again with two contrasting curves, but with concave below convex, like a church bell. In the period 1765-1810 the arched top and in 1815-45 the chamfered top were very common. However, from 1780 to 1810 balloon cases were also made and from 1810 to 1860 lancet cases. During the 19th and 20th centuries various style revivals saw the re-emergence of the arched, the bell top, the chamfered top, the lancet and the balloon case. Engraved back plates are one of the glories of 17th and 18th-century English craftsmanship and the style of engraving can help to date an antique Bracket clock. Around 1660-70 the first bracket clocks only had the makers signature engraved on the back plate. About 1680 the whole plate was covered with acanthus scrolls ending in tulip flowerheads, (tulip engraving). From 1685 clocks were engraved with acanthus scrolls with birds dolphin heads and human or fantastic masks. By 1735 most figural engraving had gone leaving only scrollwork, which became increasingly Rococo in style. In the 1740s, the engraving included chinoiserie motifs. By 1830, the end of the Regency era, the back plate had only a wheatear or egg-and-dart border. By Victorian times most bracket clocks had no engraving.